Wheelersburg senior Jalen Miller signed his letter of intent to play collegiate football at Morehead State University Wednesday afternoon. 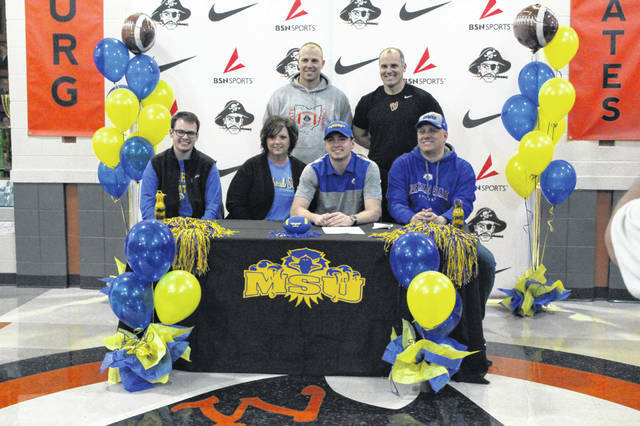 WHEELERSBURG – As soon as Jalen Miller stepped on campus at Morehead State University, he knew that would be his future home for the next four years of his life. Miller’s leg happened to be one of the most consistent weapons for Wheelersburg during his senior season. Miller went 6/9 on field goal attempts with a season long 46 yard make, as well as going 55/61 on extra points through the Pirates 14 game season which includes their state semifinals appearance in Division V.
Miller’s favorite memory as a member of the Pirates football program that has experienced tremendous success in recent years? You guessed it, the extra point that forced overtime in the 2017 state championship game after Makya Matthews’ touchdown reception. Along with Miller’s favorite memory during his high school career, he says he’ll never forget what it meant to don the orange and the black every Friday night.